Shaftesbury is progressing a £15m development at the eastern gateway to Chinatown that will create a 48,000 sq ft mixed-use scheme providing a range of new double-height restaurant and retail units across up to three floors. A key part of the scheme will complement Chinatown’s existing F&B offering, with units ranging from 400 sq ft to 4,300 sq ft. The development is scheduled to complete late spring 2017. Central Cross has been conceived by Shaftesbury to provide a critical mass of commercial space that meets the aspirations of domestic and international operators seeking a flagship restaurant location in London’s West End. Central Cross borders Chinatown London to the west and the major thoroughfare of Charing Cross Road to the east, and is located where Covent Garden, Soho and Leicester Square meet. The site is opposite Leicester Square Tube station and a short walk from Tottenham Court Road Crossrail station, which is set to become the busiest transport hub in the West End when the service commences in 2018. The restaurant element of Central Cross, with elevations to Newport Court and Newport Place, both Chinatown London gateway streets, will create seven new restaurants, three with external seating, a first for Chinatown London. 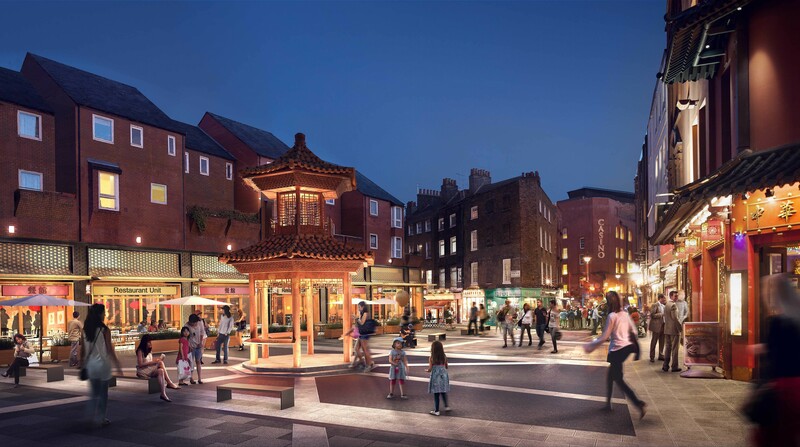 Newport Place is also to be pedestrianised and enhanced to create a landscaped public space which will become a new focal point for Chinatown. Julia Wilkinson, Portfolio and Group Restaurant and Strategy Executive at Shaftesbury, said: “Central Cross’s curated mix of new Chinese and East Asian F&B concepts will attract a cosmopolitan consumer, providing an opportunity for operators to connect with a young, multi-cultural, foodie audience throughout the day and into the evening, seven days a week. Shaftesbury has confirmed the appointment of DCL as the restaurant agent. Nash Bond and BGP are advising on the retail element.